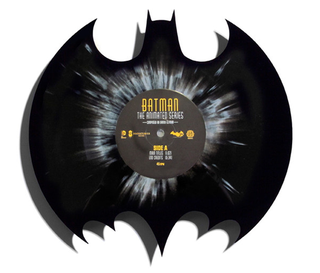 Holy Record Pressing Batman, it's a Bat-logo-shaped Vinyl! After a series of smaller, character-themed Vinyl records based on Batman The Animated Series earlier this year, the fine folks over at Mondo are back with an even fancier Vinyl record inspired by the Dark Knight - cut into the shape of the Bat Emblem. The Vinyl is going into full production for release in 2015, but Mondo have printed 1,000 copies of each Variant ready for a special sale commencing today, which would get you the Vinyl in the next few weeks just in time for the Holidays - once those 2,000 copies are sold out, you'll be able to pre-order it for the pressing due out next year. If you want a chance at an early copy, Mondo will reveal the time it goes on sale via their Twitter account.